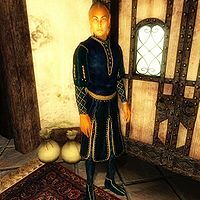 Voranil is an Altmer Noble who runs the Riverview in Cheydinhal. He throws the best parties every weekend, and anybody who's anybody in the city goes there. Unfortunately, that doesn't include you, and it never will. 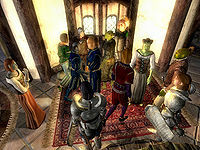 He is reputed to mistreat his staff and seems to be a skooma addict, since you may find some on the top floor of his house. His employees aren't that nice either, as two of them have a dark secret. Voranil wears an upper-class outfit consisting of a blue velvet outfit and a pair of blue suede shoes. He carries the key to Riverview, as well as a large amount of gold. Speaking to Voranil will have him claim that you are unworthy of attending his parties; "I'm Voranil. I'm guessing you're angling for an invitation to one of my super parties. Well, forget about it. Invitation only. And no invitation for you, stranger." Asking him about Cheydinhal will have him remind you that you are not invited to any of his parties; "You're not on my list. And that's all I have to say. If you were somebody, I'd know. But I don't, so you aren't." Voranil is the owner of two black horses - one in the city stables, and another in Brindle Home. The horse in Brindle Home seems to be a mistake on the part of the developers, who appear to have copied and pasted the Cheydinhal Stables cell without changing ownerships.